Continue to full interview review here. 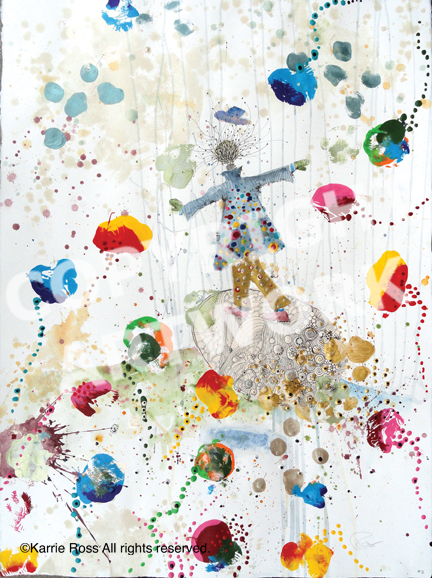 That lonely figure standing amid a chaotic background is a continuing theme in her latest works on paper. In Nature: The ONE with Water, the armless figure stands in water, towering high above the tiny wave breaks below. 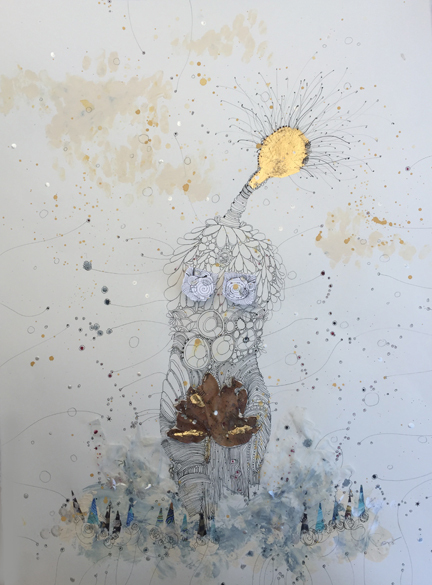 Her tapering neck—bright, lightbulb head glowing gold—sways and bends dangerously as the paint-spattered wind whips her about, her trunk, filled with a visible brown miasmic grief, firmly rooted in place. In another, Where is the Water?, a smaller figure is seen buried from the waist up (ala Samuel Beckett’s Winnie in Happy Days) in a similar watery. Assailed from above by flying, pizza slice-shaped darts—some aimed at her, others seemingly deflected by her circular wings—she still glows, a silver statue of strength. 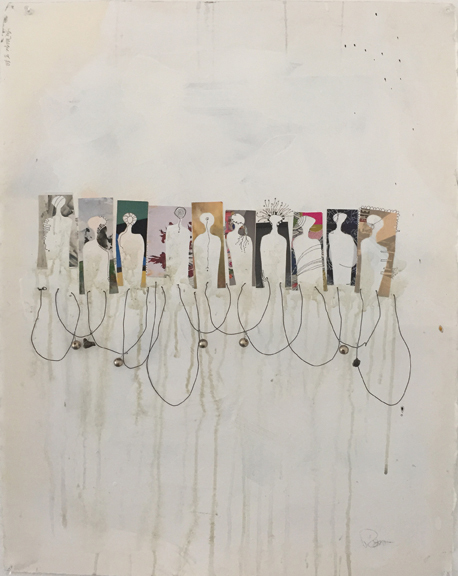 In the mixed-media The Magic of Ten, ten of the outlined figures stand in an uneven row against a background of dripped paint that looks like a combination of watery mold and running mascara. 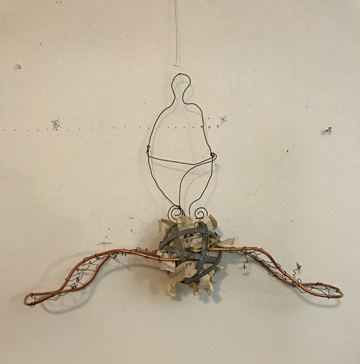 Instead of a single figure going it alone, Ross has linked the figures with wire, making them more of a chain gang, suggesting strength through a united front. Being targeted by the slings and arrows of life covers a lot of artistic ground for many artists: the fears of not being seen; the long hours in a studio by oneself; the accompanying depression that comes with never making quite enough money doing what you love; having to take meaningless side gigs to make ends meet. It can feel like one is continually beset. Ross’ work is a grand statement that she’s around, fighting, despite what life has handed out to her (and us, by extension). Instead of being crushed under that weight—as so many of us have—she is extending an open hand, and saying stand up, come with me, we’re safer in numbers. Dave Barton Has interviewed artists from punk rock photographer Edward Colver to monologist Mike Daisey, playwright Joe Penhall to culture jammer Ron English. He writes art reviews for the OC Weekly for over twenty years, the last eight as their lead art critic. Watercolor is the primary media that Ross uses. The painting begins on a dry palette with infusions of pen and ink, oil and acrylic, and sometimes torn paper. 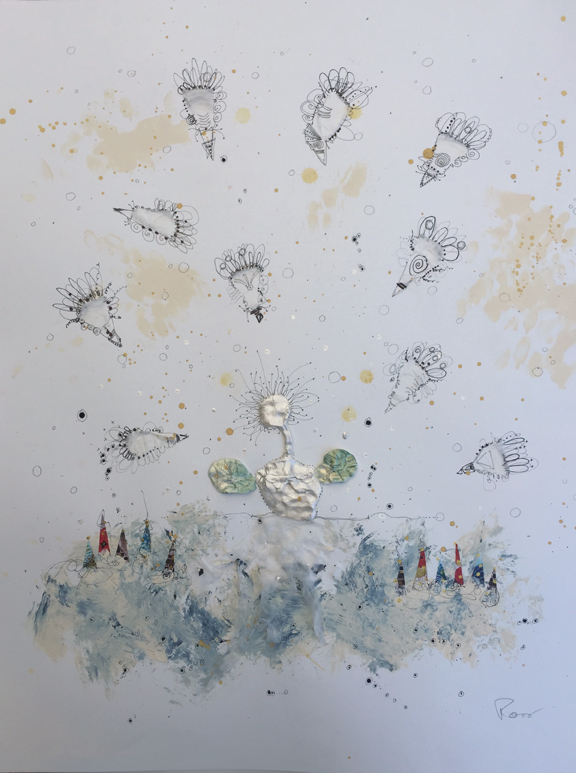 Her doodles are reminiscent of Cy Twombly’s organic scribbles set in a field of lyrical abstraction. Spirals, a tonality of blended color,and metallic bejeweling embellish a framework that is grounded in graphic design and color theory. Stylized figures appear whimsical yet allegorical in a resplendent cavalcade to ignite the viewer’s attention. The juxtaposition of semiotic imagery and magical realism creates a mise-en-scène that is metaphoric of Brecht’s theatrical alienation, in which the audience is distanced from emotional involvement by a simulated performance. 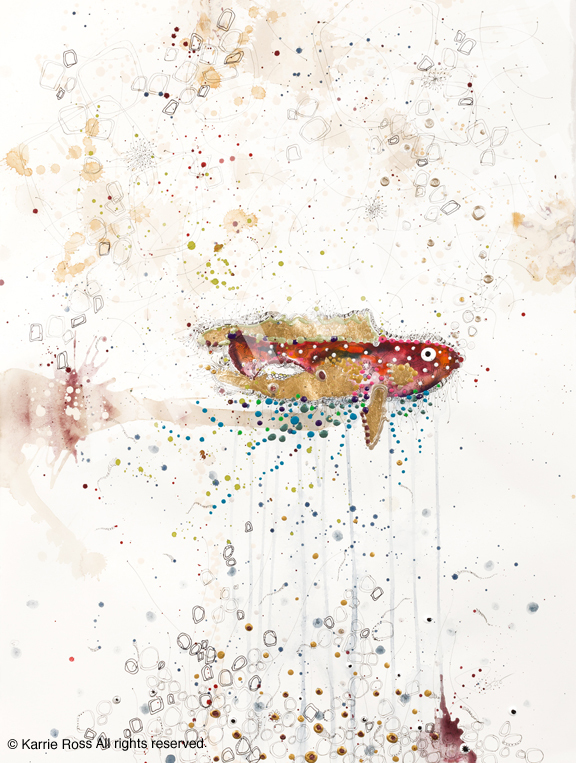 Figurative and graphic illustrations are cast as playful characters that dance across each piece with quizzical abandon. These incarnations seem to veil an angst that serves as a touchstone and catharsis for Ross, perhaps for life’s complexities. Yet ultimately, these sub-layers of existence reveal her luminous characters in a joyful expression of synergistic continuum. 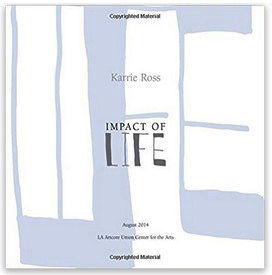 Karrie Ross lives a fully creative life, moving daily between two modes of working. As a book designer and author, with a background in advertising and marketing, she creates direct interpretations to suit the assignments she receives. 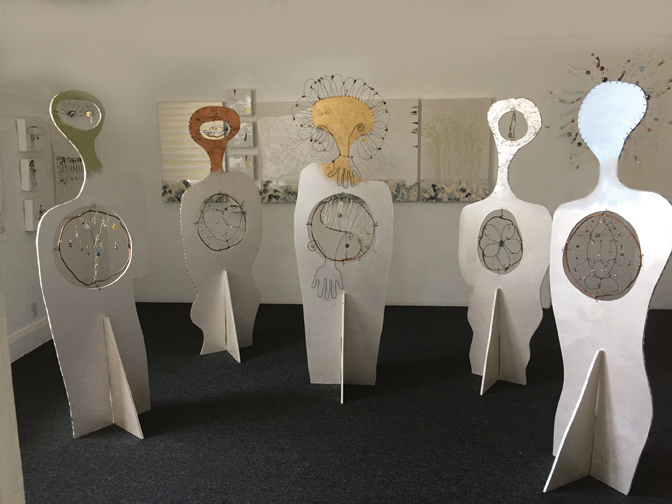 As an artist with fifty years of experience with a full range of mediums, she comfortably shifts to the opposite, and works from instinct and mystery as a way to further the intense focal energy she carries within her. Her art work is about the pursuit of answerable questions. She lives for them, and frames a life through the use of questions, rules and parameters. Quite different from rules of authority where one is left only to choose obedience or rebellion, the sort of rules she discusses are more like tinkering with the instructions for playing a game. Rules introduced to increase the level of intrigue, parlay with chance, and turn a straight line into a garden path. Likewise there isn’t an absolute answer so much as call and response, diving and resurfacing beneath the waters of her search in a game of Marco Polo. 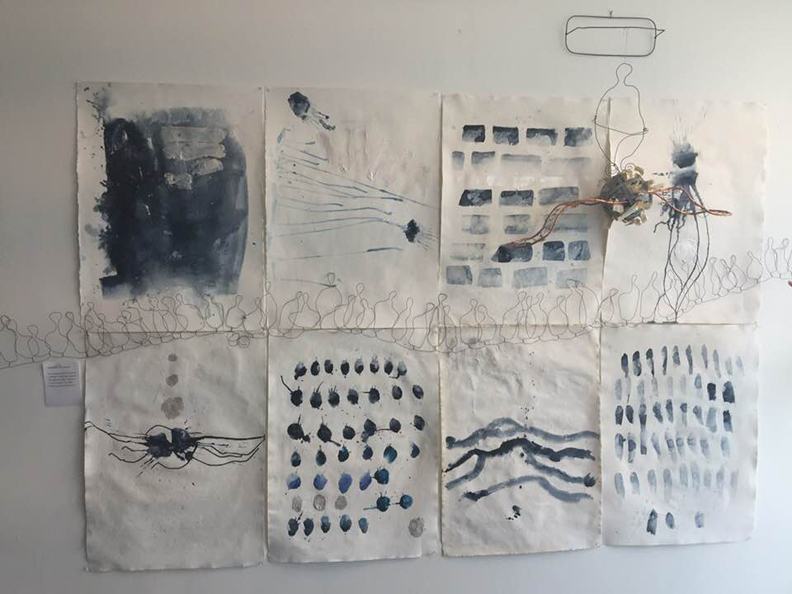 She searches for an unguided answer in the work, whether it’s conscious or unconscious, and uses this to measure the degree of finish in a piece. She moves through materials and surfaces at will, and tends to take on a cluster or group of materials to work over at one time. It is as though she were an irrigation system, trying out new crops in various fields, and directing the gates of her waters in pulses that reach several ends at once. Creating rules as she works, in the most playful sense, are key to her process. This is significant to her, she wasn’t aware of the rules (her own role in making them) when she was younger. Being aware of them means being able to manipulate them, having control over who she is, a source of growth and joy for her as she becomes increasingly familiar with how much she can direct her own perceptions. The works have a dreamy excess to them, colors outlined with frenetic ink strokes that fizz and pop, her elements in a halo of static electricity. A visiting art critic called these marks obsessive, and in art obsession is not a liability. Spotting the grief in a particular work, Ross was delighted to hear it. Even though there is a pleasant sturdiness, a kind of holistic whimsy that characterizes their outer glow, the devil is in the details, and the pictures are raucous records of many emotions and thoughts. The artist has in reserve specific information regarding what she was going through in a particular piece, but she’s not telling, expressing the sentiment of many artists, that she’s just not interested in telling others how to see. The only reason I wanted to stop and look at this particular piece is because I feel it has elements of all of the different things that I love, that are going on in other pieces throughout the whole show, but they’ve all found their way into this one image. What I mean by that is, for example, Karrie and I have been talking about this abstract figurative continuum. One of the things I love about a lot of the work is that, even though it all very clearly read as a pictorial space with objects and figures and actions, this piece, if you take out these seven little trees right there and you don’t see them, this whole expanse doesn’t even necessarily read as a horizon line anymore. It reads as this very beautiful gestural…and this more forceful, and four to five different kinds of abstraction or abstract expressionism. Then you put these tiny, little marks a little ink, very little it couldn’t be more schematic. as far as describing a tree goes. There are a couple of them, and that’s it. Then, all of a sudden, this whole thing becomes a horizon line or a hill top. You have this green color you read as a meadow or a grass or an natural space. You have all this stuff starting to read as a sky, weather, or atmosphere. You get this pictorial space, and all of a sudden, this egg form, it could very easily be a boulder. But you know, if you look throughout the work, that eggs are recurring imagery in the work. I love this fish mostly because, if you take out just its head you don’t even have to take out the whole fish, take just head out all of a sudden, the whole thing becomes completely abstract, completely non representational. It becomes about the shapes, the colors, the textures, the tiny, tiny little mark making that’s super controlled, the splatters that are much less controlled, and those organic versus ritualistic shapes. It takes on a completely different character, once you see the whole creature. Abstract. Fish allegory. All of a sudden, there’s narrative “What does that mean? Where does that come from?” and the symbolism that goes on in that. ~Shana Nys Dambrot is an art critic, curator, and author based in Los Angeles. She is currently LA Editor for Whitehot Magazine, Arts Editor for Vs. Magazine, Contributing Editor to Art Ltd., and a contributor to the LA Weekly, Flaunt, Huffington Post, Palm Springs Life, and KCET’s Artbound. She studied Art History at Vassar College, writes loads of essays for art books and exhibition catalogs, curates one or two exhibitions each year, recently published her first work of short fiction, exhibits photography, and speaks in public with alarming frequency. An account of her activities is sometimes updated at sndx.net. 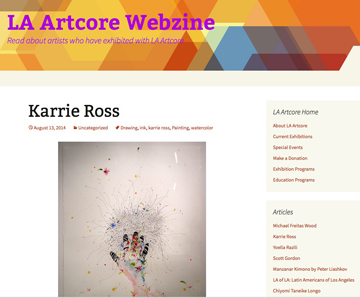 She bills herself as “Karrie Ross, California Artist,” but the lady is much more than that. 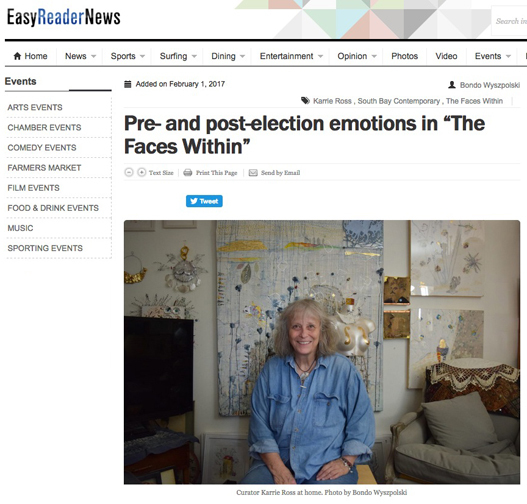 The self-proclaimed former “hippie gone wild” has also made good as an award-winning author, a book designer, a poet, fine artist, and a blogger. Blending all these talents together skillfully makes her what could be the prototype for a successful 21st Century artist. It’s not that she uses technology to create her art, but that she is a master at using today’s tools – the Internet, websites, a blog and more – to put her work before the public. 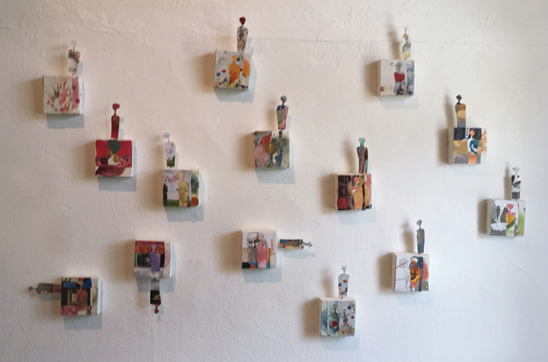 Yes, she follows the traditional path of displaying her art in galleries (she will be featured in a two-person exhibit at Topanga Canyon Gallery beginning Aug. 31), art shows and the like. But she understands today’s realities. A 1967 graduate of Birmingham High, Ross has fond memories of “cruising the Boulevard on Wednesday nights in my boyfriend’s 1949 Chevy Coupe.” But today she’s more apt to be cruising the Internet, following up queries from her website or putting finishing touches on a new blog entry.